Richmond Senior Secondary will be holding its 90th anniversary celebrations at the school on Minoru Boulevard. 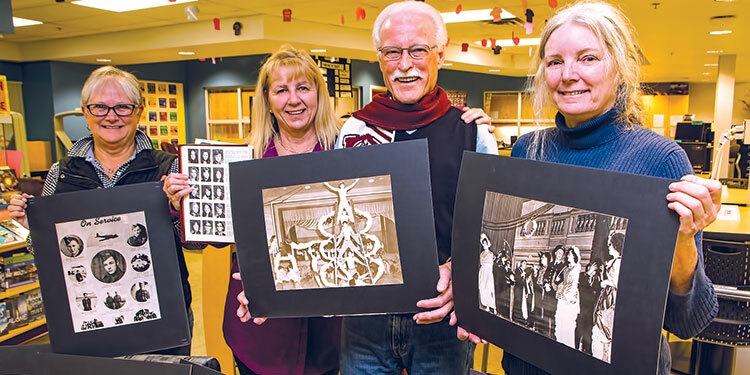 Our city’s oldest high school, Richmond Secondary, celebrates its 90th anniversary on Saturday, April 21 from noon until 6 p.m.
John Montgomery, from the school’s graduating class of ’58, has a long history with the school. It was then on the old site, approximately kitty corner from today’s Costco. Richmond Secondary later moved to a new location, near today’s Cambie Senior Secondary. That building became Cambie Junior High when, one last time, in 1952, the school site moved to its current location on Minoru Boulevard. Montgomery recalls one of his mother’s teachers, Roy McNeill, was Montgomery’s principal when he graduated from the school’s third iteration, now torn down but on the same grounds as today’s modern building. That spirit encouraged students to taste all the opportunities the school offered. “For me it made me become involved with different subjects and aspects of thing I never would have done. I became involved with acting. I was social but shy,” she says. The school was different then, she says. McKenzie, who grew up on Jones Road between St. Albans and Garden City Roads, said those were simpler times. Montgomery grew up in Steveston. Later in 1956, Steveston Junior High School opened up, eventually becoming the high school for that edge of Richmond. Steveston’s teams and logo referred to the village’s fishing past while Richmond High’s was a horse theme. Grad time and the annual football game between the two schools often occasioned some high-spirited hijinks. “Rivalry with Steveston? I didn’t ever get involved but I heard the stories of loads of horse dung left on steps of Steveston High and loads of fish guts on steps of Richmond High,” McKenzie laughs. McKenzie remembers the previous incarnation of Richmond High that opened in 1957. The new school was finished ahead of schedule and the move accomplished over the Christmas holidays. “They tried to bring parts of the school they were going to tear down and bring it into the new one. All the wooden seats, top of the bleachers, removed and milled for something else, part of gym floor and framed it, on wall of current school. Marnie Maitland took the time to make sure there was a place for every graduate composite photo from 1927,” says McKenzie. For the event, open to all former Richmond High students and staff, the alumni association is hoping to have vintage cars in the parking lot along with some food trucks. Inside, the group plans skits from the drama club, music from the band, as well as lots of old photos and memorabilia arranged by different eras. If you would like to lend a hand or have anything from your era to add to the celebration, see the ad in The Sentinel’s classified section. “It will be a very laid back day for people to come and celebrate the school being 90 years old,” says McKenzie.